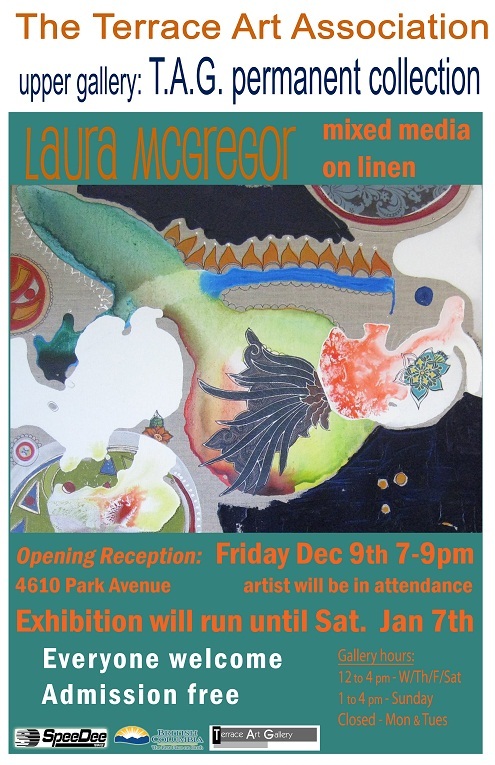 In December 2011, Laura will showcase her most recent patterned works on linen in the lower level of the Terrace Art Gallery. A community arts promoting event to showcase and support local organizations in the Terrace area. The evening will consist of a 5-course set meal, pipes and drum band performance, language of trees - poetry reading, live classical dinner music, tiered-raffle bidding, original art works for live auction and more! Tickets are limited - buy yours now! Tickets: $60 each or 2 for $100 available at Misty River Books, Sidewalkers, George Little House, Terrace Art Gallery. For the month of October, Laura will be showing past and present paintings at Don Diego's Restaurant. Come check it out... and eat some fabulous food! 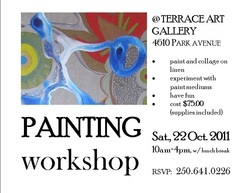 Please RSVP to save a spot in Laura's third painting workshop at the Terrace Art Gallery. Cost is $75 per person - includes all supplies. For the month of September 2011, Laura will exhibit her most recent works on linen on the walls at a popular coffee shop in Terrace, BC. Come out to the Terrace Art Gallery for a beautiful quilt exhibition! 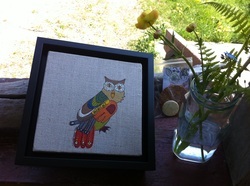 Wanting to get your hands working with needle and thread? Visit the gallery on Saturdays in September for a sew-in ($5 drop-in fee to participate). For all those local music-lovers, dancers, and campers... I hope to be seeing you at Smithers Music Festival this weekend. I will be casually sharing a vendor's booth with a friend. Pop by and say hello! On Saturday, the 25th of June Laura will be offering the second of the series of four workshops at the Terrace Art Gallery. Cost $75.00 includes all supplies. This weekend I will be participating in the First Annual Artists' Spring Studio Tour. What a fantastic idea! Come out and see local artists and their studios. Ticket packages are only $5 and are available at Misty River Books, George Little House, and Terrace Art Gallery. Limited number available. Come out and support your local artists!